Carving is not a process that can be learned, it is a gift. I look at a block of wood and if I can see the animal within that block of wood, I can carve it. If I can’t see it but you give me directions on how to do it, I still can’t do it. You either have it [the gift], or you don’t. This quote from one of the carvers at our olive wood workshop reflects both the workers’ dedication, as well as ours to this craft. We believe that each olive wood piece made is unique and no piece of olive wood is wasted. Instead, the leftover wood from larger figurines is cut into strips and used to make our high-quality ornaments. To create one of our ornaments, an ink stamp of the design is pressed into a strip of wood which is then carefully cut out by one of the craftsmen. 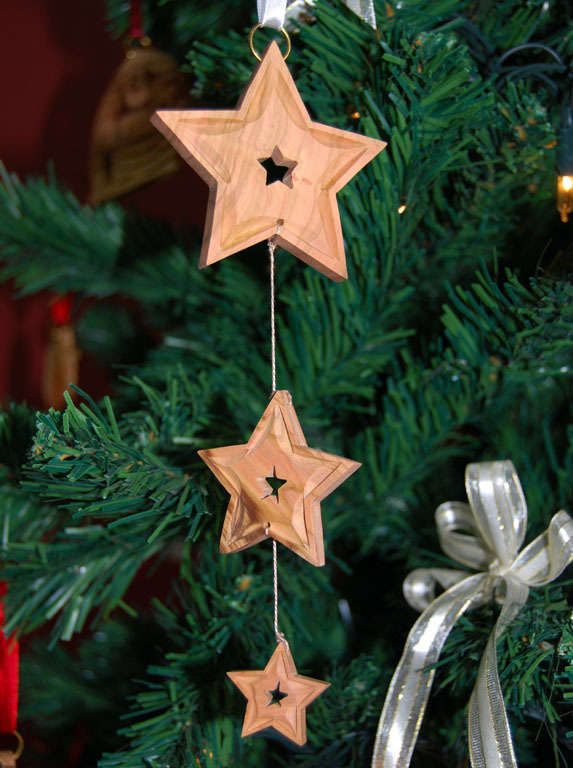 After the ornament is cut, the wood must dry for 3-4 weeks as olive wood contains natural moisture. Once the wood has adequately dried, artisans then add detail to the carving using a rotary tool similar to those found in dental offices. The ornament is then sanded 6-7 times to ensure a quality finish. Each of our ornaments are made with a commitment to the highest standard of quality as they make their way from our workshop to your tree or window. Visit our showroom or our online store during the month of July to take advantage of our “Christmas in July” sale on ornaments, hand carved nativity pieces and sets, and christmas cards.